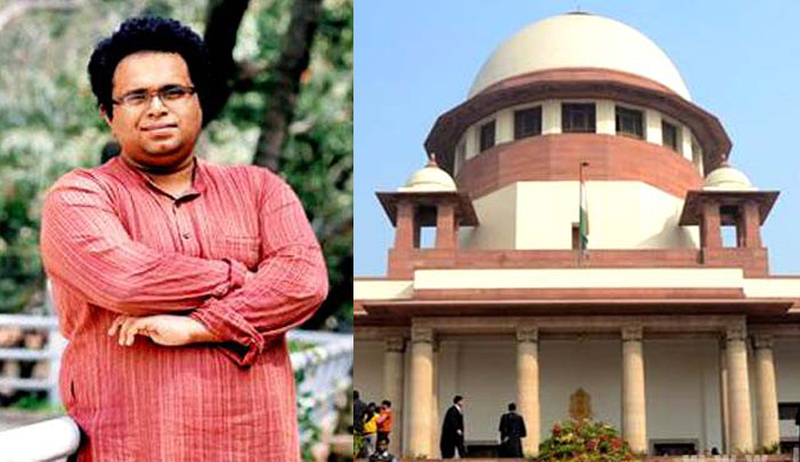 A note dated August 2, 2015 has been released by the Registry of the Supreme Court of India taking ‘serious objection’ to the news reports regarding resignation of Dr. Anup Surendranath as the Deputy Registrar (Research) of the Supreme Court. According to the Registry of the Court, the news reports, claiming that Prof. Anup resigned in protest of Yakub Memon's execution are “not only incorrect but highly misleading”. Releasing Prof. Anup’s letter dated August 31, 2015, the Registry states that he was merely repatriated to his parent institution, National Law University, Delhi, as he wanted to pursue his interest in research projects in which he is involved in. The note also demands a corrective by media. “In order to dispel any misgivings created due to distorted news item, the Electronic and Print Media may immediately present the correct facts before the Public,” the note says. “I have been contemplating this for a while now for a variety of reasons, but what was played out this week at the Supreme Court was the proverbial final nail — I have resigned from my post at the Supreme Court to focus on death penalty work at the University. Though in the letter of resignation Professor had not mentioned about order in Yakub Memon'case, the timing of the resignation and contents of his Facebook post generated much media heat suggesting reasons other than what is mentioned in the simple resignation letter. Dr. Anup Surendranath was appointed as the Deputy Registrar (Research) in the Supreme Court in an advisory capacity with the Chief Justice of India on institutionalizing research efforts at the Court and on institutional reforms. Prof. Anup graduated from NALSAR, Hyderabad in 2006 and was awarded the Felix Scholarship in 2007 to read for the BCL at the University of Oxford. After achieving a Distinction in the BCL examinations in July 2008, he was awarded the Peter Birks Memorial Scholarship by the Faculty of Law, University of Oxford to read for the M.Phil in Law. He was once again awarded the Felix Scholarship in June 2009 for the D.Phil in Law along with the Gregory Kulkes Scholarship in Law from Balliol College, University of Oxford. He is a notable columnist in The Hindu and also writes for the blog, Law and Other Things. At NLU Delhi, he is currently pioneering the Death Penalty Research Project. The Death Penalty Research Project was conceptualized in May, 2013, in order to address the absence of empirical research on death penalty in India. Its aim is to develop a basic socio-economic profile of prisoners sentenced to death in India and map their experience with all aspects of criminal justice system. In consultation with experts like Usha Ramanathan, Dr. Yug Mohit Chaudhry and Justice S. Muralidhar, they designed a study that would focus on interviews with prisoners sentenced to death, their families and their defense lawyers. It has been working on the issue with path-breaking rigor ever since its establishment. It took 16 months, 400 interviews and over Rs 30 lakh for the ‘Death Penalty Research Project’ to see the light of day. “The failure of the State is simply that it finds it acceptable to sentence people to death on the basis of a criminal justice system that has very little credibility. We use a broken criminal justice system to inflict great suffering through the death penalty – and we can’t ignore the fact that this suffering for the prisoner and his/her family starts from the day a prisoner is sentences to death. To live in constant uncertainty about your life, anticipating death every single day is sheer torture and we must recognize it for what it is,” he said, commenting on the State’s failure on the issue. The Project displayed tremendous conviction in April this year, when it successfully raised the target amount of Rs. 7 lakhs in 7 days, to help in rehabilitation of Adam Suleiman Ajmeri, one of the acquitted persons in the 2002 Akshardham terror case. The Death Penalty Research Project first came in contact with Adam Bhai in February 2014. According to Prof. Anup’s account, Adam Bhai contacted them a couple of months after his release, with the troubling news that he was finding it very difficult to make ends meet. Eleven years in prison and inhumane custodial torture had left him incapable of doing many things. Adam Bhai was arrested in August 2003; almost 11 months after the terrorist attack on the temple, illegally detained for close to a month and was tortured to confess the crime. He was then convicted by a Special Court in 2006, which sentenced him to death. The death sentence was confirmed by the High Court in 2010. In May last year, the Supreme Court had acquitted all the six accused, after they had spent almost 11 years behind the bars. “Work like this continuously teaches us so many things and Adambhai’s struggle has taught us that the romantic notions of freedom has so little meaning when faced with the grim realities of daily survival,” Prof. Anup has said after their effort reached success. With the money raised through DPRP’s support, Adam bhai now plans to rent a small area of land on the outskirts of Ahmedabad to rear goats and cows to sell milk and milk products. Prof. Anup has certainly devoted his much admired credentials to the development of the field of law in the country. He has been dedicated to his research project and has stood up for what he believes in. While the debate on his resignation continues, his allegiance with the project is sure to provide light to the unconscionable man. Read the press note of Supreme Court and Anup Surendranath's resignation letter.